Sound On Sound Magazine Articles: The magazine's regular 'Session Notes' column provides lots of practical insights into real-world project-studio recording methods (with accompanying audio files), and frequently demonstrates handy monitoring and isolation workarounds which you can use when working with multi-room setups. 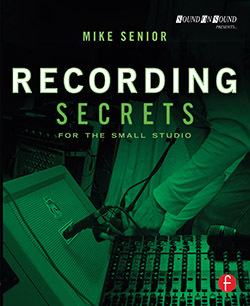 In addition, here are a few other one-off articles which also shed useful light on this kind of recording from a small-studio perspective: 'Guerilla Recording: How To Record Bands Outside The Studio'; 'Recording A Jazz Band On Location'; 'Recording Bands On Location'; and 'Andrija Tokic: Recording Alabama Shakes'. Recording Live Concerts: If you're interested in recording live concerts, you'll need a whole extra set of skills in addition to what's covered in 'Recording Secrets'. To dip a toe in the water, check out these two articles: Recording A Live Show and 7 Tips For A Successful Live Concert Recording. For more in-depth coverage, Bartlett & Bartlett's Recording Music On Location: Capturing The Live Performance is a good place to start.